Apple has been always known for brining innovations to their iPhones with software and hardware optimization. And this time, they are planning to bring something Unique and more efficient like never before on their 10th anniversary. Rumours suggest that Apple will launch iPhone 8 and iPhone 8 plus and it will create a real revolution and they are already planning and building it to revolutionize the future of smartphones. So, Our expectations and estimation of iPhone 8 and iPhone 8 plus is really touching the sky. 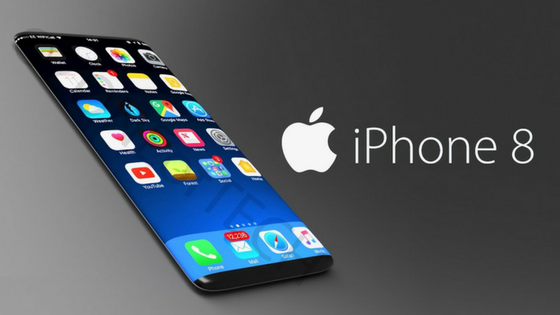 Here in this article we will discuss about the concept, specs, features and the release date of this Apple iPhone 8 and iPhone 8 plus. The concept of the upcoming iPhone 8 and iPhone 8 plus is unique and advance. These are going to be a special Smartphones as these will come on the 10th anniversary of Apple iPhone. These featuring an edge-to-edge display that eliminates bezels entirely along with the front home button. There is an OLED screen running all the way to the edges on each side instead of LCDs screen, a home button hiding under the screen, four speakers – one on every corner of the phone, and the function bar at the bottom. These smartphone devices will be designed favorably with good material that will be fancy in looks. These will come in two sizes, 4.7 and 5.8 inches display with the face detection and iris recognition concept. These smartphones will have the water resistant feature. iPhone 8 and iPhone 8 plus will bring minor hardware upgrades. These iPhones are said to run iOS 11 which is the refreshed version of Apple’s mobile operating system. These smartphones will create the evaluation and surely user will like this smartphone the most. iPhone 8 and iPhone 8 plus will be launched with aluminum body and three glass model. The smartphone devices will be designed favorably with good material that will be fancy in looks. Moreover, iPhone 8 and iPhone 8 plus will be a framework with aluminum, stainless steel, and some glass. The new iPhone 8 and iPhone 8 plus are expected to come with a bezel-less display which will be something unique. Moreover, Apple is planning to create its new iPhones in a flat way which might be 4.7 inches to maximum 5.8 inches. An OLED display eliminates the need for the backlighting that’s used in traditional LCDs in these smartphone devices. These will almost certainly require the removal of the Home button from the front of the phone, to slim down the handset’s bezel. Hopefully, the display will be easy to use and navigate as well. As per the rumor, Apple is planning on introducing new vertical dual camera arrangement instead of a horizontal dual camera system. These two new iPhones are expected to get launched with 16 MP f/1.7 Primary Camera and 8 MP front facing camera including 3D sensing capabilities that use technology by PrimeSense to finding location and depth of objects in front of it, perhaps enabling facial and iris recognition. These smartphone devices will support 4k recordings as well. Taking good pictures and video clips with these new iPhones become absolutely easy. For selfie lovers, the Front Camera features are quite impressive. The camera feature is quite good according to the range. This iPhone 8 will come with the best processor of A-11 that will be built on a 10nm FinFET architecture. These smartphones will have the 3 GB RAM which is same as the iPhone 7 Plus. It will efficiently give a good functioning. The storage capacity of this device will be available in three options which are 64 GB, 128 GB, and 256 GB hopefully. The memory of these devices is more than enough to store large data files and apps. The processor is quite good of these smartphones if we compare these to its price. The operating system which will be used in these iPhones device is iOS 12. However, it can be upgraded later to iOS 12.3.2. So, the users are getting a good operating device with such an affordable price. Current iPhones can be unlocked using the fingerprint, thanks to the Touch ID sensor. Rumors said that Apple will likely to launch iPhones with iris recognition and face detection technology in 2017. The iPhone 8 and iPhone 8 plus will have a 3D laser scanner for face recognition, replacing Touch ID. Apple will use the facial recognition method for locking and unlocking process of iPhone. The iPhone 8 and iPhone 8 plus will hopefully come up with non-removable Li-Ion 2900 mAh and 3000 mAh battery. The batteries will come in 2-cell pack. These batteries are quite ok in range as these can take much workload. Users can rely on the battery for surfing the internet or downloading. The battery is the powerhouse of any phone, so the user can easily maintain their workflow with this power. Wireless charging technology is certainly getting attention. Apple will be launched with wireless charging feature in its upcoming iPhones. All new iPhones launching in 2017 will support fast-charging by the adoption of Type-C Power Delivery technology. It means power can be refilled without the need to plug the device into a socket. Apple is going to add inductive wireless charging to the iPhone 8, or iPhone 8 plus. This means users of these smartphone devices will be able to place the phone on an inductive surface and it will charge. There are no exact updates about the release date of Apple’s iPhone 8 and iPhone 8 plus. Apple will launch its new version of the iPhone in the first or second week of September on the 10th anniversary of the Apple. It will be launched at the IFA event which will be held on 1 to 6 September of 2017. But rumours suggest that Apple iPhone 8 and iPhone 8 plus could be delayed to October or November due to the production delays because of supply issues with the 3D camera system and problems laminating this system with the new OLED glass screen. It means users may have to wait a bit long before getting iPhone 8 and iPhone 8 plus which is rumoured to be the most exciting smartphones from Apple. Users can get their mostly like smartphone only 1100 USD which is quite affordable if we compare its features and advance technology which will use in this device.